Googling on Apple and Microsoft: Running Windows tasks in Mac OS X! Running Windows tasks in Mac OS X! See my new iMac's screen! 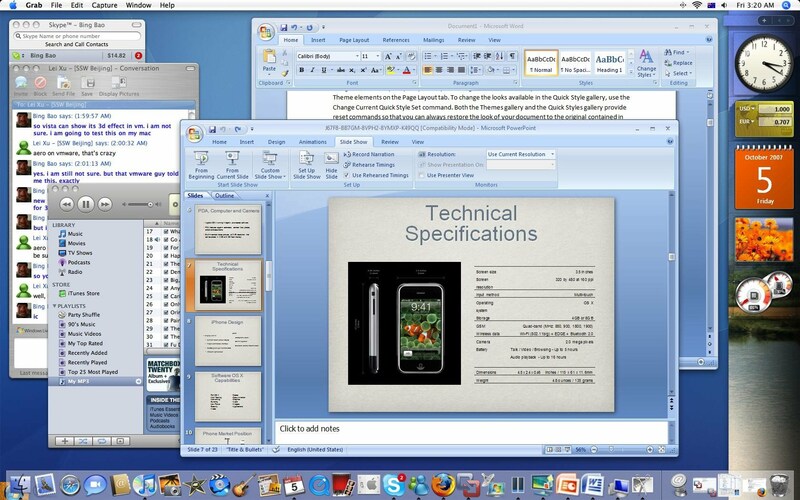 Please note that Windows tasks such as Word 2007, PowerPoint 2007, and even Vista Sidebar are running with other Mac OS X tasks, on the same desktop! Thanks to VMware Fusion, the new VM solution for Intel Macs, You can move Windows applications out of its virtual machine onto Mac desktop. I was at VMware Virtualization Forum 2007 - Sydney (Darling Harbour) this afternoon. A VMware guy there told me that the official release of VMware Fusion would be available in Australia next week. Its full package price would be A$ 119. You have mentioned exceedingly remarkable relates ! ps beautiful spot. "I perceive a violence in your vows, Besides hardly the newss.